Who honestly gave this a 1 or a 2? Come on. Season 2 Episode 7, he bashed his skull in to draw Karstark over so he could get the keys to his chains. If that speech was in a book, people would be analysing it for the symbolism, potential foreshadowing, or even just for a hint of the author's own ideals and thoughts. But it's on a screen, thus it can never be as intelligent or well thought out, instead it was just getting in the way of the awesome visual spectacle of the upcoming fight. It was a terrific scene and deserves plaudits both for the writing, but also the acting. Ridiculous, this was one of the best episodes yet. My personal favourite, if not necessarily the one I think is the best. Your comments are always a joy to read, voice of reason. Yeah I can see Victarion killing him when his guard is down. I hope Barristan makes it to Westeros, I'm not ready to say goodbye to his character yet. If Michelle Fairley isn't returning for whatever reason, then there are really only three plausible options for who takes on the role of Lady Stoneheart in my opinion. 1) Talisa Stark - Probably the most logical option, as she has the closest ties to both Robb and the Red Wedding than anyone other than Catelyn. Just as Lady Stoneheart does, she has a distinguishing wound that could be as equally definitive of her character as Catelyn's cut throat is. 2) Beric Dondarrion - It may be that he feels some guilt regarding his treatment of Arya. This, in addition to a sense of honour and nobility could mean that he desires vengeance on the Freys for their actions. 3) Brynden Tully - I've read a lot of speculation that he could be the one to take control of the Brotherhood in the WoW. If this is true, then it's perfectly logical that he should begin his ties with them now. He was also present at the RW and so knows exactly who was responsible, whilst his family ties to both Catelyn and Robb make him an ideal bringer of justice to the Freys. Now, obviously these suggestions could create problems regarding Brienne's storyline, as none of them have ever met her (?). Nonetheless, I feel that the character is too important to simply cut, and so if Michelle Fairley doesn't return, then for me it has to be one of these three. For the record, I hope that she does come back as Lady Stoneheart, if only because she's been in it since episode 1 and I'm not ready to say goodbye yet. My God you're right! How did I miss that, it's quite clear that in the series the RW is the result of Roose's unrequited love for Catelyn! The old 'If I can't have her, no one can!' scenario. Barristan Selmy had a little wine, but he is clearly not hammered, if at all drunk, he's just a little quiet. If he had been lying on the floor in front of Daenerys, sitting in his own urine and vomiting on Missandei then that would have been an issue. He's like Bond, he's at his best after a few drinks. We could see this next episode, there're a lot of shots of burning tents in the preview. Even if it isn't shown, I don't think it detracts from the emotional impact, but I would nonetheless put good money on seeing some kind of resistance/battle in the next episode. 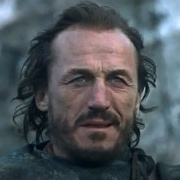 Did anyone else think that Roose Bolton's smirk at Catelyn was acted absolutely perfectly? What a great way to show just how badly the man's betrayed Robb, a perfect reveal to the audience of his treachery.